Since we’ve launched, we’ve been Stumbled Upon, Linked In, looked via Facebook, twittered and checked out. Thanks! Your feedback is necessary for us to grow and become better, so come forth with all your suggestions, brickbats, whatever you want to say. 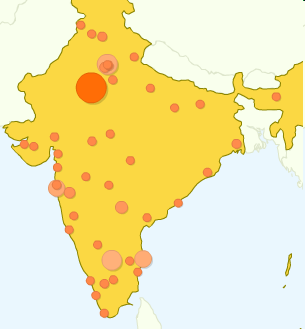 Check out the pockmarks all over India from where we’ve been hit. Cheers! If you are a company with more than 20 employees that have a salary over 10,000 per month (Total Gross) and registered under the Shops and Commercial Establishments Act, then you are also applicable for registration under the ESI Act. If however your company draws power then you are applicable for ESI if you the total number of employee drawing wages of 10,000 (Total Gross) is equal to or more than 10. Once the wages of an employee goes above the 10000 mark they can be suspended from ESI. However, ESI must continue to be deducted at the new wages (which might be greater than 10000) until the financial half is completed. (ESI submission are made bi-annually, once for each Financial Half in April and October). As per ESI act, Employee and Employer must both contribute towards ESI. As per current law, Employee contributes 1.75% of their wages, while the Employer contributes at 4.75% of the employee’s wages. Rounding rules indicate that Employee contribution must be ceiled to the next Rupee in case the deduction amount has a Paisa component. The same applies to the employer as well. Note: Employer’s contribution is calculated by multiplying the sum of wages of all ESI applicable employees with the employer contribution percentage [ (Σ(wages of ESI applicable employee) * 4.75%).ceil ]. In Salaree.com, you have a bit more control over how you manage your ESI employees but not too much! Salaree.com allows you to mark each employee that you wish to put in ESI manually. The calculations etc however are not configurable and maintained by our team for your ease. You must supply the relevant company details in the “Settings” tab to activate ESI calculations. All relevant reports and challans pertaining to ESI can be downloaded from the application itself.